Iraq is furious at Turkey’s military incursion, but the US State Department doesn’t seem too concerned. Its spokesman stonewalled RT’s questions about the Iraq-Turkey row, getting personal in the process. Turkey has sent tanks and hundreds of soldiers to a base near the city of Mosul this past weekend, and on Wednesday, Turkish jets bombed Kurds in northern Iraq. The government in Baghdad has described the actions as a violation of Iraqi sovereignty, has issued an ultimatum to Ankara to withdraw, and has even asked NATO to rein in its errant member. The dispute has compelled the Iraqi parliament’s Defense and Security Committee to ask for a review of the security agreement with the US-led coalition, as committee member Hamid Mutlaq told RT on Wednesday. 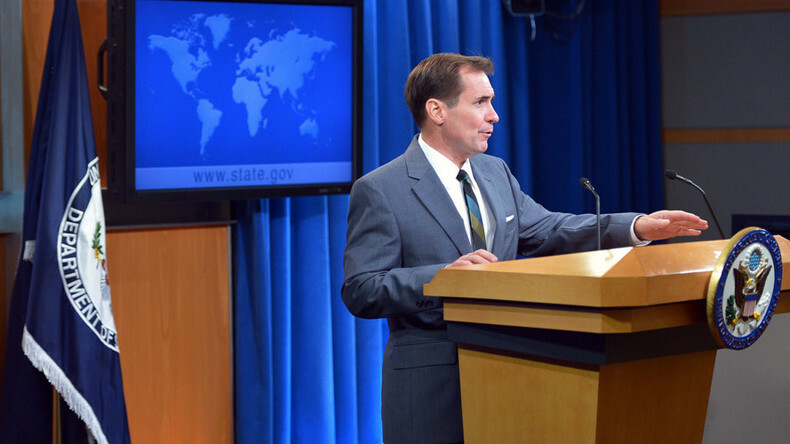 When asked about it by RT’s Gayane Chichakyan, however, State Department spokesman John Kirby first said he was unaware of Iraq’s concerns. The US wants “any action against ISIL – inside Iraq, specifically – to be done with full cooperation and [in] coordination with the Iraqi government, and their sovereign permission,” Kirby insisted, noting that he had said the same thing months before, as the Pentagon spokesman and uniformed admiral. Is it really “ridiculous” or “baseless” to ask a question about what the Iraqis obviously consider an important issue, one that they are obviously not “working out” bilaterally with Turkey, from a diplomatic spokesman representing the country so fond of pointing out its leadership of the 65-nation coalition? You be the judge.